A fair that covers the ABC’s of college is a valuable tool and Monday, Nov. 19 was the first time the Southern Illinois University Edwardsville East St. Louis Charter High School (CHS), in partnership with the Greater East St. Louis Community Fund (GESLCF), offered the opportunity for its students. CHS senior Anaiah Brown wants to major in business, with an emphasis on culinary arts. She is considering attending SIUE, Southern Illinois University Carbondale or Fisk University in Nashville, Tenn.
Keenan Collier, CHS junior, wants to major in business and minor in medicine. “I want to have my own real estate business, and I like medicine,” said Collier, who plans to head to the West Coast for college. Fourteen-year-old Allen Searcy visited the Ranken Technical College table at the fair. “I want to learn the plumbing trade, so I can help people with their bathroom and kitchen problems,” the CHS freshman explained. “Many students we talked to knew what they wanted to major in already, which is a good sign they are focused on their goals,” added White. Freshman Evan Bonner, who likes to play the piano and draw, wants to be an animator. The efforts of the Greater East St. Louis Community Fund center on two primary approaches: Collaborations and Partnerships – The Fund looks for projects which involve a broad base of community organizations working together to yield a comprehensive approach to benefit the residents of East St. Louis and Brooklyn. The Greater East St. Louis Community Fund provides scholarships to East St. Louis and Brooklyn residents who meet eligibility requirements. 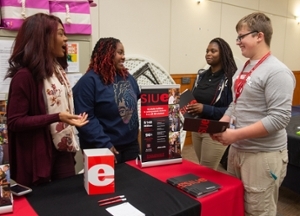 Giving information about SIUE (L-R) are Ashlei White, SIUE admissions counselor and recruitment coordinator, and Makesha Harris, EdD, assistant director for Pre-Collegiate Programs at SIUE. CHS students are junior Michael Townsend and sophomore Makayla Scott. 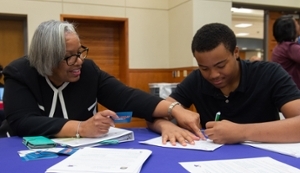 Pamela Coaxum, Greater East St. Louis Community Fund (GESLCF) executive director, explains the day’s College Fair to CHS freshmen Allen Searcy. 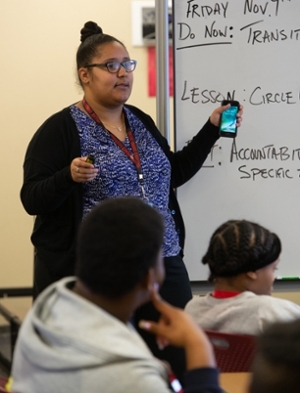 Maya Sansard, of the Illinois Student Assistance Commission, talks to students on how to select the best college for them.